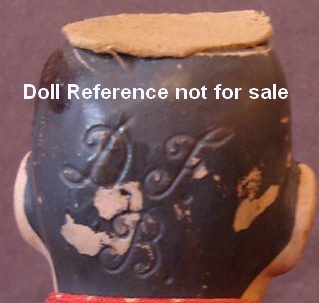 De Fuisseaux Girl doll, 18" tall, bisque socket head with a solid dome, blue glass eyes, closed mouth, early composition and wood jointed Sonneberg body with straight wrists, doll mark F1 in script and stamped in red ink on the back of her head. Not much is known about the Belgium doll maker De Fuisseaux, also spelled Finsseau, it is accepted however, that they began creating their stunning character art dolls around 1909 to 1913 when their Baudour factory was destroyed during World War I. Dolls have a bisque shoulder or socket head, glass or painted intaglio eyes, various sizes, cloth, composition or wood jointed bodies. Some DeFuisseaux doll markings are B3, B4, DF, DFB and F1, F2, F3 which was made for them by the French firm of Fleischmann & Bloedel (or Blödel). 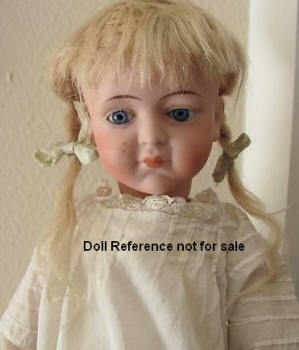 Dolls are highly prized by collectors for both their rarity and artistic beauty. DeFuisseaux was part of the European art doll movement near the end of World War I, which also included the French doll makers Albert Marque, J. Van Rozen and Marion Kaulitz Munich Art dolls and others. 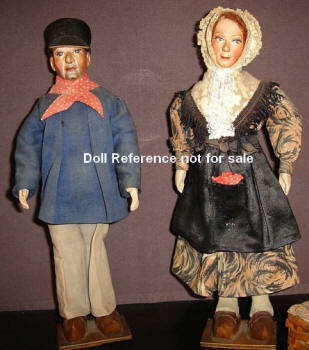 Bisque head peasant couple dolls dressed in original regional costume by DeFuisseaux of Baudour, Saint Ghislain, Belgium. The woman doll is marked: D.F.B. 2 and the man doll is marked; D.F.B 3, height is about 7 1/2" for each doll. The painted faces have austere features with painted intaglio eyes, wooden shoes and a wicker basket with cloth cover which is not shown.